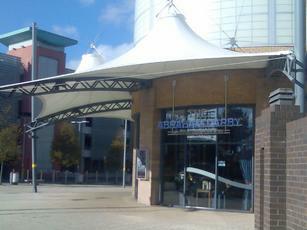 First visit to this Wetherspoons in a large shopping centre. Yesterday was the last day of their beer festival. It was also my first visit to this particular festival and this pub. Ales were Sixpoint Brooklyn Bitter, Sadlers Red IPA, Hop Bomb & Jack's Pale Ale, Batemans Colonel's Whiskers, Roosters Yankee, Adnams Broadside, Greene King Abbot & Ruddles Best. Ciders were Sheppys Farmhouse & Woodsprite. The place itself has the typical Wetherspoons furnishings. Although it feels much more light and airy than most, as it has lots of windows. Not a bad branch of this chain at all. The comment below is correct in saying you wouldn�t call this place your local and I would go as far as saying you wouldn�t call it a pub. Instead it�s a coffee shop/restaurant that has the added bonus of selling alcoholic beverages. Ok maybe that�s a bit unfair, but it does sell a hell of a lot of coffee and food. Now if you've read any of my other reviews you'll see I hate pubs that sell large amounts of coffee simply because it slows service. But I think The Abraham Derby might have solved the problem. They've basically got one till that simply serves coffee, I think you can order anything from it but if you just want coffee you queue up there. It leaves the rest of the bar free to take other orders. It also means that if you just want a beer or food you�re not waiting for ever to get served because the staff aren�t all swamped by coffee orders. Now I have noticed a few problems with the system for example I noticed a man go to the bar and order some food and drinks including coffee and he was immediately shot some dirty looks from people waiting in the "coffee queue" simple because he got served before them. Actually they shoot everyone dirty looks because they can't grasp that coffee takes longer to prepare than any other drink and so they have to wait longer but also they fail to see how the system works and why its in place. Ok, the pub its self is big, the decor is nothing to shout about but is nice none the less. The back bar is quiet impressive though you'll see why when you visit. As its part of a huge shopping centre its very busy nearly 100% of the time even more so during school holidays. Finally food was good when we visited as too was the beer, so no complaints about this place from me. 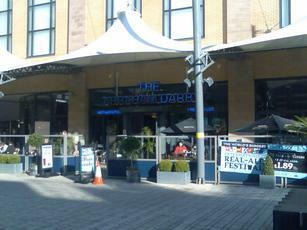 Its a Wetherspoons so dont get excited. Because its part of a shopping centre the dhss element is missing but the flow of shoppers can give the place a manic air. Beers were good, the food standard fare. A good place to sit while the mrs is shopping for shoes. Not the sort of place anyone calls their local.